IoT turbo-charged by AI, advanced robotics, automated vehicles incorporating sensing data with other datasets, powerful big data analytics like machine learning driving automated decision-making. The collection of technologies we are currently calling artificial intelligence (AI) is heralding the next industrial revolution. We are now seeing their rapid convergence into systems – cyber-physical systems – that will have unprecedented impact on humanity through deep economic, social and cultural shifts. To face challenges like these head on, the ANU strategic plan outlines the need for new education models and new pathways towards commercial and social applications for ANU research, via structures adjacent to established research and teaching programs. Distinguished Professor Genevieve Bell was appointed the first of the new ANU Entrepreneurial Fellows and founded the 3A Institute in 2017 on these principles. After 20 years as a techno-anthropologist in Silicon Valley, Genevieve returned home with the conviction that the world needs a new applied science to enable the safe, ethical and effective design, integration, management and regulation of cyber-physical systems. In 2016, the World Economic Forum suggested we were entering the 4th wave of industrialisation; one characterised by cyber-physical systems. These systems will rely on the mainstreaming of the Internet of Things, Big Data, and Machine Learning. This new Era could result in significant economic, social and cultural shifts. At the ANU we also recognise that this new Era, like those that came before, will necessitate new ways of thinking, doing and making. Building a new intellectual approach is critical. The 3A Institute seeks to do just this. We are researching a set of critical questions around Autonomy, Agency and Assurance for cyber-physical systems. We are also exploring the metrics by which we will measure the success of these systems, and the possible interface(s) between humans and CPS. How do we think about the notion of autonomy and how do we build for it? This is both a technical set of questions and a philosophical and public policy set of questions. The notion that we are building autonomous systems that make decisions and possibly affect their surroundings without our involvement has complex implications in terms of liability and responsibility. Beyond the technical challenge of building truly autonomous systems lie complex ethical questions that the 3A Institute will tackle. What degree of ‘self’ empowerment do we give autonomous systems? Conversations are unfolding globally about the degree of independence to give to autonomous and semiautonomous systems and how we envision our lives and interactions in a social context shared between AIs and humans. We need to explore whether we are confident with AIs acting and interacting autonomously on our behalves in a range of fields. The 3A Institute will drive a broad range of conversations with stakeholders across sectors to identify challenges and opportunities. Will these systems be safe? We have the opportunity to shape the future of our societies as we transition from a concrete, machine-powered world to one that will increasingly revolve around Big Data and powerful, autonomous cyber-physical systems. WHAT ARE THE METRICS BY WHICH WE MIGHT MEASURE THE PERFORMANCE AND SUCCESS OF NEW SYSTEMS? Technical systems have typically been measured on their efficiency. However when systems start to learn and change their behaviour over time, an objective of efficiency may begin to clash with ideals that have previously been implicitly or tacitly inserted into the process by the humans in the loop. How do we start to conceptualise building for sustainability, for beauty, for values? HOW MIGHT WE INTERFACE WITH TECHNOLOGIES, SYSTEMS AND EACH OTHER IN THIS CONTEXT? In previous decades, the way we interfaced with a computational system was through a screen and a keyboard. This paradigm is already being disrupted as ‘smart’ objects enter our lives. What will it mean when AI-enabled systems are all around us, sensing and responding to us? How to do protect our privacy? What happens to all that data? And how do we signpost the fact that we are interacting with a learning or intelligent system? In 1843 Ada Lovelace applied her imagination and mathematical genius to develop the world’s first complex computer program. She did this 100 years before a computer existed. Then she was written out of history. 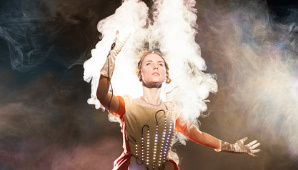 In Ada.Ada.Ada, Lovelace tells her story using an LED dress which she operates – live on stage – using her wearable tech satin glove. The show combines beauty, story-telling and technology to make an important point: in a world where history, especially the history of technology, seems to be written by men, for men, the role of women who were crucial to the creation of modern computing is generally overlooked. The Ada show exists to celebrate just one of the many women who was instrumental in creating modern computing. Hopper Down Under is a celebration of diversity in technology in the Asia-Pacific. Created by women technologists, for women technologists, this inaugural conference is produced by AnitaB.org. Hopper Down Under is modeled on the AnitaB.org Grace Hopper Celebration, aimed to empower women technologists in the Asia-Pacific. It brings together women technologists at all levels, from undergraduate to CEO, along with members from industry leading companies, academia, and research, to build relationships, learn, and advance their careers. Hopper Down Under offers technical and career development sessions, including Poster Sessions, a Career Fair, a Tech Expo, Mentoring Circles, and more. Inspired by Silicon Valley-style rapid and iterative prototyping, the 3Ai team is testing a radical curriculum of postgraduate courses to inform the creation of this new applied science. The challenge that cyber-physical systems present our society calls for skills development that will profoundly disrupt the educational environment. In 2019 we are challenging the status quo with an experimental, immersive year-long curriculum of postgraduate courses. Applications for 2020 will commence late 2019. Sign up to our mailing list below to be informed when applications open. The 3A Institute is co-founded by the Australian National University and CSIRO's Data61. The 3A Institute is hosted in the College of Engineering and Computer Science at the Australian National University in Canberra, Australia.